I was looking up something at Liverpool University and came across the Liverpool Knowledge Quarter, which is a project to do what it says in the name. One development is Paddington Village. Paddington Village is a £1bn flagship expansion site sitting at the eastern gateway to the city centre and has been earmarked as 1.8m sq ft of science, technology, education and health space. In November 2016 a draft masterplan was published, outlining the plans for the site, which will be developed in three phases: Paddington Central, Paddington South and Paddington North, with phase one due to commence in the coming months. At 30 acres, Paddington is a sizeable urban village, inspired by the sense of community you’d find in the likes of Greenwich Village in New York. Not only will it be a great place to live but a great place to work, discover and socialise, with state-of-the art workspace, labs, cafés, restaurants, shops, accommodation, a hotel and teaching, examination and events space. The sites first two anchor tenants have already been announce and will see as new Northern Centre of Excellence for the Royal College of Physicians and a new 45,000 sq ft education and learning facilities and 262 residential bed spaces for Liverpool International College. There are also plans in place for a new train station, making this phase two of the Paddington Village development key to the new transport infrastructure for the area. I also found some more about the Paddington Square station in other places. This news item in the Liverpool Echo says or implies the following. The new station would use some existing tunneling like the Edge Hill Spur. The new station would connect to the City, Northern and Wirral Lines. The new station would be close to the new Royal Liverpool Hospital. The vision is to have in built in five years. I talked about Merseyrail’s new trains in Thoughts On Merseyrail’s New Trains. Lime Street station is at the West and Edge Hill station is in the East. The lines into Lime Street are a dark scar between the two stations. The Royal Liverpool Hospital is at the top of the map and I think the triangular site to the East will be Paddington Village with Paddington Square station. Note that there are three abandoned freight tunnels leading from the Docks to Edge Hill station. On which one will Paddington Square station be built? 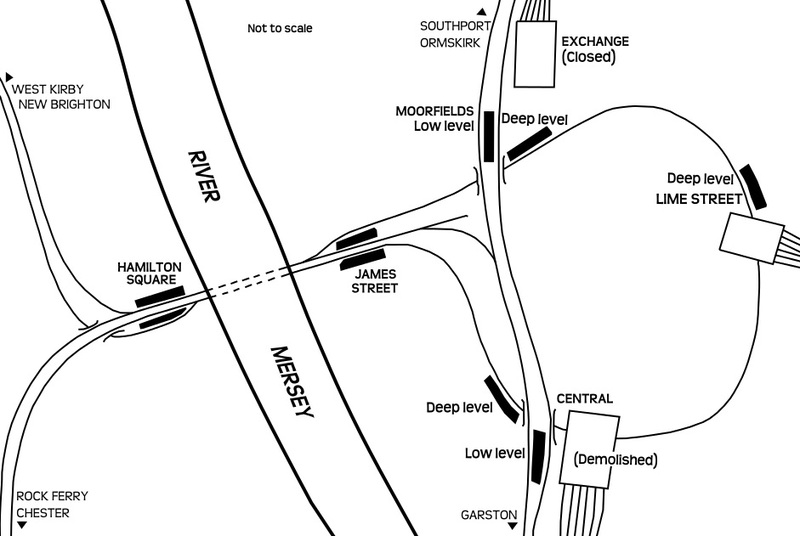 This map from Wikipedia, shows the Loop Line under the Centre of Liverpool. Could trains come in from the East and feed into this loop? At present 12 trains per hour (tph) come in from the Wirral Line and after stopping at James Street, Moorfields, Lime Street, Central and James Street again, they go back under the Mersey to Birkenhead. So could trains from Edge Hill join the loop and go through Lime Street, Central and Morrfield stations before going back to Edge Hill? If the loop was running under Automatic Train Operation (ATO) with the new Stadler trains, I suspect that the Loop could probably handle upwards of the current 12 tph. Perhaps even 24 tph, which could give. 4 tph to Chester via Runcorn and the Halton Curve. Or whatever Merseyrail thought was the correct service. Liverpool would have a unique underground railway. It could be a superb urban railway, with services to the following destinations, from all stations in the Loop. Passengers going between say Chester and Wigan would get off at Moorfields and wait for the next Wigan train. These tunnels were only built in 1977 and the loop is due for updating in the first half of 2017, so at least the tunnellers will know where everything is buried. One advantage is putting all the suburban services in the basement, is that this would release platforms for services to Glasgow, across the Pennines and for HS2. It certainly seems to be a project that can be realised. It is an ambitious project, but then who can forget four lads from Liverpool in the 1960s, who had ambition and just imagined? I went to Liverpool University in the Autumn of 1964. The University in those days had a Rag \Week, which in Liverpool was called Panto Week. This link to the University of Liverpool web site, gives a flavour. There used to be a debate in the Mountford Hall of the Guild of Undergraduates and usually someone locally famous was invited. In 1965, it was The Scaffold. I don’t know how I got there, but a few days after seeing the Scaffold, I ended up in a Hall of Residence listening to a tape of the debate of the previous year. It was a virtuoso performance by Ken Dodd and it went on for hours. I wonder, if that tape still exists! There’s More To Liverpool Than Football And The Beatles! This morning, this story on the BBC web site entitled ‘Major Win’ In Pancreatic Cancer Fight is one of the top stories. This is said. The disease is so hard to treat that survival rates have barely changed for decades. But data, presented at the world’s biggest cancer conference, showed long-term survival could be increased from 16% to 29%. The findings have been described as a “major win”, “incredibly exciting” and as offering new hope to patients. I must admit that I feel a touch of pride, as the study was led by Professor John Neoptolemos at Liverpool University, which was where my late wife and I met when we were both students at the University. But I also feel a touch of relief for others, who might get this awful cancer in the future, as now they may stand a better chance of survival, than did our youngest son; George, who survived just a few months after diagnosis. I also raised a small sum of money for the research by visiting all 92 English and Welsh football clubs in alphabetical order by public transport. The main funding for the resarch included Cancer Research UK and I think some EU money! The BBC story also says this. The trial on 732 patients – in hospitals in the UK, Sweden, France and Germany – compared the standard chemotherapy drug gemcitabine against a combination of gemcitabine and capecitabine. I’ve looked up the two drugs mentioned and both are on the WHO Model List of Essential Medicines, which are the most important drugs needed in a basic health system. An article in The Guardian is also illuminating. This is said. So this is not some elite drug for the rich, famous and powerful, but one that might even be applied everywhere. I must admit, that I’ve shed the odd tear this morning!